Everybody loves a good story, but only some of us love data. Even so, an insight worth having is an insight worth sharing, so how do we share our data insights with people who don’t love data? Telling a story is a great way to share data insights, and Power Map tours provide a great way to tell stories about geographic and time-based data. Wow! I had no idea that energy production data could be so interesting! I guess I knew that we burn a lot of coal and natural gas, but I never realized that there was a time when hydroelectric power produced most of our energy in the United States, and that it still does across the American northwest. It’s also fascinating to watch states experiment with nuclear power for a few decades starting in the 1970s, and you can really watch natural gas take over the energy market in many states just over the last decade! So how do you put together a story like this? You may be surprised just how easy it is with Power Map. You might not be surprised that we start with data in Excel. In this case, our data set has well over 17,000 rows, one for every historic power station in the United States including location, energy type, capacity, and initial date of operation. Then we launch Power Map and start exploring the data. There are two important Power Map concepts that we’ve used here: Tours and Scenes. You’re always using Tours and Scenes in Power Map whether you’re aware of it or not, so you might as well be aware of it because if you’re not then you might be missing out on a great opportunity! Tours are the top-level storytelling concept in Power Map, and every Tour consists of one or more Scenes. If your workbook already has one or more tours then launching Power Map asks you which existing tour you want to work with, or if you want to create a new tour and work with that. You can also export your tours as video for easy sharing. Just click “Create Video” in the Power Map ribbon. You can rename your tour by clicking on the tour name at the top of the Tour Panel. Use Scenes to capture the individual insights that you want to share. 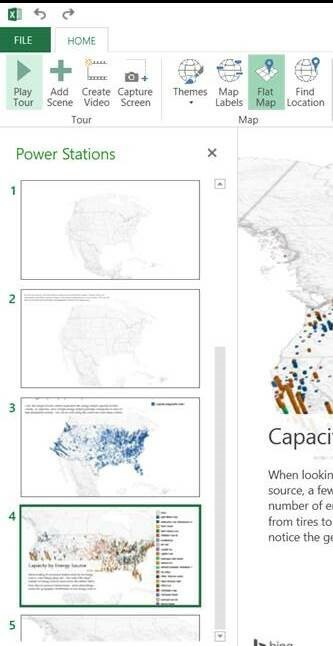 Go ahead and explore your data in Power Map! Click “Add Scene” in the ribbon when you’ve found something that you like and that you might want to share later. Power Map will capture your current insight as a scene in your tour and you can continue exploring without worrying about losing that insight. Organize scenes in the Tour Editor like you would organize slides in PowerPoint. Scenes toward the top happen earlier than scenes later in the tour. Each scene is independent of every other. You can change the theme of a scene, its data, and move and zoom in and zoom out the map of your current scene, all without changing any of the other scenes that you’ve already captured. When you play your tour (Play Tour, or Create Video on the ribbon) then Power Map takes care of transitioning intelligently between your scenes, creating cinematic camera moves between scenes where appropriate. Not satisfied with Power Map’s scene and transition defaults? You can customize them through Scene Options. Just click on the little gear icon on the scene that you want to change in the Tour Editor. You can do things like give each scene a name, change how long it lasts or how long its transition lasts, and change what the camera does during the scene. For example, you can make the camera circle around the scene or push in or zoom out while the world rotates beneath it. Combine these tools in any number of ways to create compelling stories that you can share with anybody to get them excited about your data and the insights that you discovered using Power Map.